My husband doesn’t like musicals. I knew this going in. His logical accountant brain can’t wrap itself around the notion of someone bursting into song because, you know, they walk outside and it’s a Beautiful Morning. Never mind that our youngest daughter does this all the time. She sings spontaneously on the street and in the house and in the car; in the car she might randomly launch into a song that is entirely different from the one playing on the radio. This doesn’t bother her at all. It is somewhat difficult for the rest of us. Our youngest daughter was only eight when she was in The Pajama Game so she played a Button Sewer, kind of a mini-cast member. All the eight year olds were Button Sewers; they sat on wooden boxes in front of the stage and pretended to stitch buttons onto pajama bottoms. During chorus numbers they would join the rest of the cast and sing and spin around each other and take little ballet steps. But they could be short on stamina – one Saturday the director scheduled a matinee and an evening show, and during the prep for the late performance, we found the Button Sewers sprawled out on their boxes, sound asleep. Fortunately, they were able to rally by curtain call. My husband loved that show. 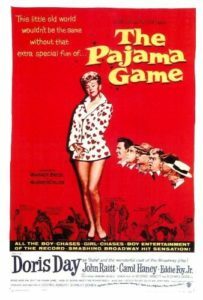 The Pajama Game was made into a movie in 1957, starring Doris Day. She was the only actor in the film who was not part of the Broadway cast; it seems Hollywood needed a star. She was perfect for the role, anyway, and the film did pretty well, just the sort of upbeat, happy movie musical that was popular in the fifties and early sixties. I caught it on TV once, the colors were a little washed out, and the picture was grainy, but it was still a lot of fun, full of great performances. But there weren’t any Button Sewers.